Despite the South African government's efforts to tackle the poverty and inequality that characterises South African social life, the political settlement that brought an end to apartheid in 1994 has not been accompanied by economic freedom, and the material conditions of many South Africans remain dire. Nevertheless, government contends that it is possible to eliminate poverty and significantly reduce inequality by 2030. This is according to the inaugural report of the National Planning Commission, known as the National Development Plan, released in November 2011. The plan indicates, however, that these two objectives will only be met if yearly growth rates of 5.4% are achieved. 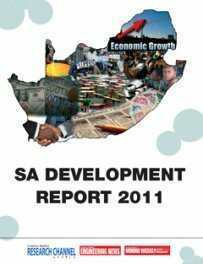 This electronic report provides insight into South Africa's development in an economic context and a social context and looks at factors, including GDP growth, employment, inflation, service delivery, basic education, healthcare, housing and land reform. The report draws on information available in the public domain. The report does not purport to provide analysis of market trends. Published on: 09 February 2012.